The Western Wall Tunnel (Hebrew: Minheret Hakotel) is an underground tunnel exposing the Western Wall in its full length. 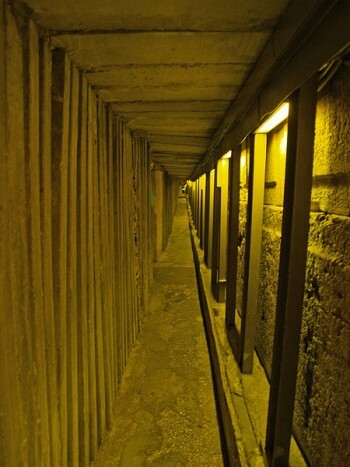 The tunnel is adjacent to the Western Wall and is located under buildings of the Old City in Jerusalem, Israel. After the Six Day War, the Ministry of Religious Affairs of Israel began the excavations aimed at exposing the continuation of the wall. The excavations lasted almost twenty years and revealed many previously unknown facts about the history and geography of the Temple Mount. The tunnel exposes a total length of 500m of the walls, revealing the methods of construction and the various activities in the vicinity of the Temple Mount. The excavations included many archaeological finds along the way, including discoveries from the Herodian period (streets, monumental masonry), sections of a reconstruction of the Western Wall dating to the Umayyad period, and various structures dating to the Ayyubid, Mamluke and Hasmonean periods constructed to support buildings in the vicinity of the Temple Mount. "Warren's Gate", lies about 150 feet into the tunnel. This sealed-off entrance has been turned into a small synagogue called "The Cave", by Rabbi Yehuda Getz, since it is the closest point a Jew can get to the Holy of Holies, assuming it was located at the traditional site under the Dome of the Rock. At the northern portion of the Western Wall, remains of a water channel, which originally supplied water to the Temple Mount, were found. The exact source of the channel is unknown, though it passes through an underground pool known as the "Strouthion Pool". The water channel was dated to the Hasmonean period and was accordingly dubbed the "Hasmonean Channel". The biggest stone in the Western Wall often called the Western Stone is also revealed within the tunnel and ranks as one of the heaviest objects ever lifted by human beings without powered machinery. The stone has a length of 13.6 meters and an estimated width of between 3.5 and 4.5 meters; estimates place its weight at 570 tons. Adjacent to the tunnel lies a museum called "The Chain of the Generations Center" - designed by Eliav Nahlieli. The impressive site, which incorporates ancient and modern Jewish history, includes an elaborate audiovisual show, and nine magnificent glass sculptures created by glass artist Jeremy Langford. Women praying in the tunnel at the closest physical point to the Holy of Holies. Regular tours take place in the ancient tunnels by the Western Wall. The Kotel Tunnels (''Minharot Hakotel'') site is operated by ''The Western Wall Heritage Foundation.'' Regular tours take place in the ancient tunnels by the Western Wall.